The quiet town of Daniëlskuil in the Northern Cape boasts the country’s first documented case of cigarette smoking. Korana and San leaders were in fact quite shocked in June 1823 when traveler George Thomas passes on the traditional peace pipe in favor of tobacco wrapped in paper! The discovery of diamonds in Kimberley led to colonization of Griqualand by the English. The Griqua people subsequently became scattered. The town of Daniëlskuil obtained official status in 1892. For the next 80 years it mainly provided support for the farming community. Due to the area having good soil and plenty of water, man has dwelt here since prehistoric times. Handmade tools, dating back 800 000 years, found in the Wonderwerk Cave 40 km outside Daniëlskuil, prove the existence of human beings. Large-scale mining of lime at Daniëlskuil has led to growth and development. The population of Daniëlskuil doubled at a stage when surrounding towns depopulated due to an economic recession. According to tradition the name of the town is derived from a natural pit – “kuil” in Afrikaans – in the dolomite structure. A link was made with the biblical figure of Daniel, who ended up in a pit with lions – hence the name Daniëlskuil. 43km South of Kuruman (Daniëlskuil / Kimberley Road) on the farm Wonderwerk. 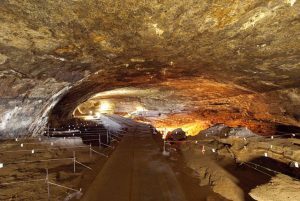 Archaeological research at this massive cave site reveals a long record of human and environmental history over thousands of years. 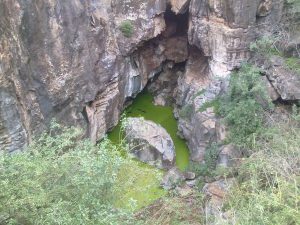 The cave and its surroundings, form a conservation area with features distinctive of the Kuruman Hills. The site is open to the public and includes an interpretative Centre adjacent to the cave. The turn-off to Wonderwerk Cave is well sign-posted about 45 km from Kuruman along the Kuruman-Daniëlskuil road, with the last few hundred meters on gravel road. The area is legendary for its diverse ecological systems and intriguing geological structures. It is well known for the unique sinkhole, Boesmansgat, to be found on the farm. Many world records in cave diving have been set up in this exceptional sinkhole. Aquatic cave amphipods and other interesting creatures are found in and out of the water. In earlier days, the small caves among the tumbled rocks in the walls of the sinkhole afforded protection to a tribe of San Bushman as well as wild animals while the lake provided drinking water during the dry winter months. Natural sinkhole that served, according to tradition, as a jail during Griqua Tribe reign. Many stories are told about the venomous snakes that lived in the pit, especially the dark green one with serrated back and soft mane. Prisoners were let down into the pit with a rope. Food and water were sent down daily for the duration of their captivity. The prisoner was given a short walking stick or “kierie” to defend himself. Some say that nobody left the pit alive. Others say that anybody who survived their first 24 hours, was set free. The congregation was served by Rev JW Meyer, who visited four times a year from Griquatown. In 1894, however the corner stone for a church was laid. It was completed in 1896. The congregation of Daniëlskuil became independent in 1913. 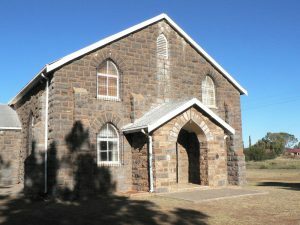 A new church building was completed in 1924, built as the older one, with local dolomite. The old town hall was completed in 1933 as part of a job-creating project. Residents were extremely impoverished at that stage, due to an economic depression and drought. The town management made an agreement with the Department of Labour to contribute on an equal basis to the cost of the building, if the project was used for job creation. During the Anglo Boer War (1899-1920) English forces built a system of trenches around Daniëlskuil, connecting key points like fountains. A force of 500 Boers attacked the English on 5 January 1901 but lost the battle due to the strategic advantage these trenches gave to the English forces. Captain George Callum, who commanded the Duke of Edenburg’s Own Volunteer Rifles (DEOVR) at Daniëlskuil, received the Distinguished Service Order for his bravery and leadership. The English also built five fortresses out of masonry dry stone – one of which can be seen on Fortkoppie. Kalahari is a word that stirs the travelers imagination and emotions, and for good reason. It is a vast land of huge vistas, climatic extremes and fascinating adaptations to harsh conditions. 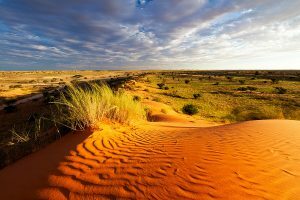 The scenery is the quintessential Kalahari – rust-red sand dunes, short and tall bushman grass, camel thorn and shepherd’s trees with plains of shining yellow ‘devil’s thorn` flowers in the rainy season. The area (Kgalagadi Transfrontier Park) also rates as one of the best sites for viewing Raptors. It boasts the martial eagle, the largest raptor in Africa, the Bateleur Eagle, considered the acrobat of the skies, and Africa’s smallest raptor, the Pygmy Falcon. The sociable weaver, creator of gigantic nests weighing up to 300 kg, shares accommodation with the latter. Life in the green Kalahari is not only provided by the rare and strange plants, animal life or vineyards. Adventures include trips on camel back, white water rafting on the Orange, parasailing on the many pans in the region, a lazy afternoon glide in a colorful micro-light high above the rolling red dunes and tough 4×4 trails in the jagged mountains of Riemvasmaak and the Mier Kalahari with its 35 to 40 meters high sand dunes. For the gentle adventurer , there are hiking trails, canoeing, mountain biking , bird watching, game drives in the national and many exquisite private game reserves, camping and fly-in safaris and even moonlit dinners in the middle of a salt pan to choose from. The Khoi people call it ‘Akoerabis’, meaning the ‘place of great noise’. The Orange River thunders its way into a deep granite gorge, giving birth to the Augrabies Falls, a spectacular 56-metre high waterfall, which came into being between 500 and 600 million years ago following an uplift which caused the river to carve todays awesome 18 kilometer-long ravine from the bedrock. The Kalahari is abundant with animal life; of the more colorful, are the Cape Flat Rock Lizard, with its vivid blue, green and orange markings, the Klipspringer Antelope with its balletic grace and the endangered Black Rhino. The Quiver tree with its peculiar shape is an icon in the province.